Earl Jellicoe GCB OM GCVO PC (the Right Honourable Sir John Rushworth Jellicoe), 1st Viscount Jellicoe of Scapa (UK 1918), and Earl Jellicoe and Viscount Brocas of Southampton (UK 1925). 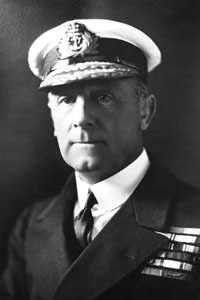 Jellicoe led the Grand Fleet during the first two years of the First World War, being in command at the Battle of Jutland. Governor-General of New Zealand 1920-24, he died 1935. British admiral of the fleet who commanded at the crucial Battle of Jutland (May 31, 1916) during World War I. The son of a captain in the mercantile marine, Jellicoe was educated at Rottingdean and entered the Royal Navy as a naval cadet in 1872. Source: "The Year 1922 in English Masonry," Dudley Wright. The Builder, National Masonic Research Society. March, 1923. p. 90.